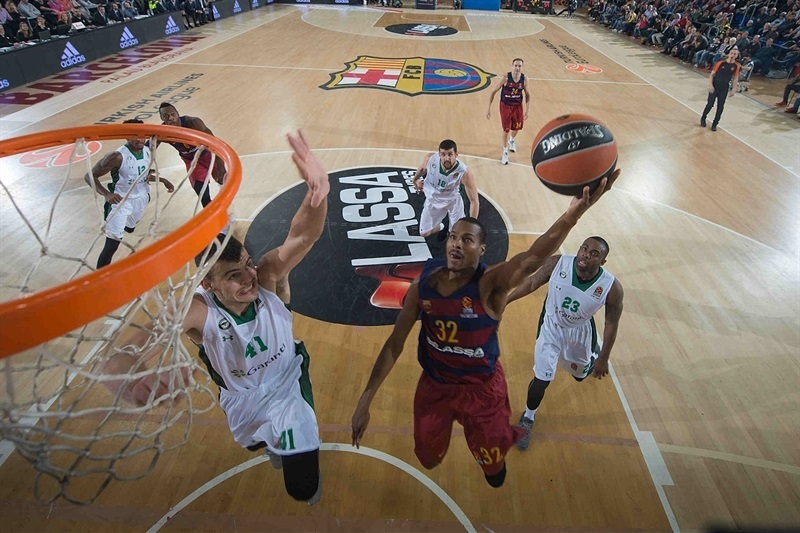 FC Barcelona Lassa reached the Turkish Airlines Euroleague Regular Season's halfway mark by downing Darussafaka Dogus Istanbul 81-77 at home on Friday. 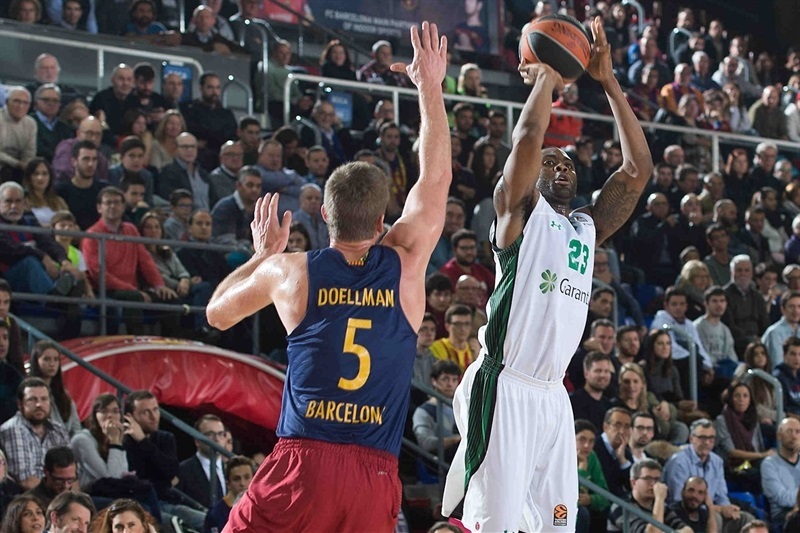 Barcelona improved its record to 7-8 while Darussafaka dropped to 8-7. 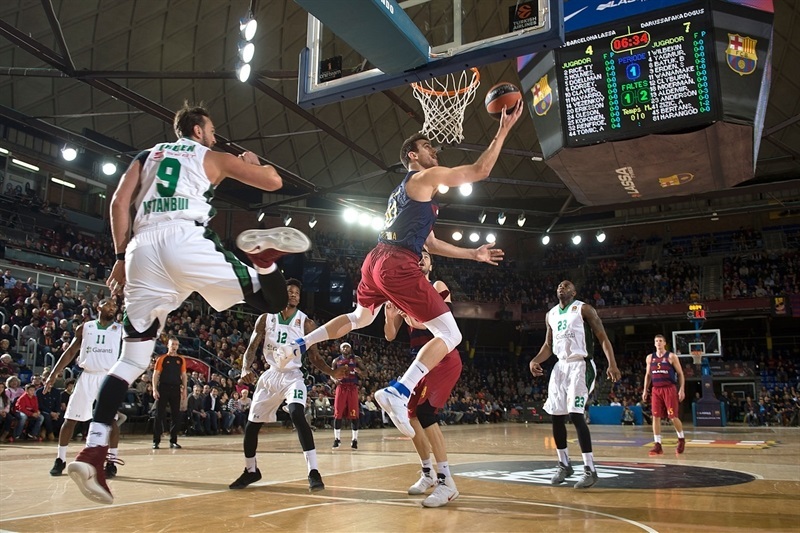 Ante Tomic led the winners with 16 points on 8-of-8 two-point shooting. 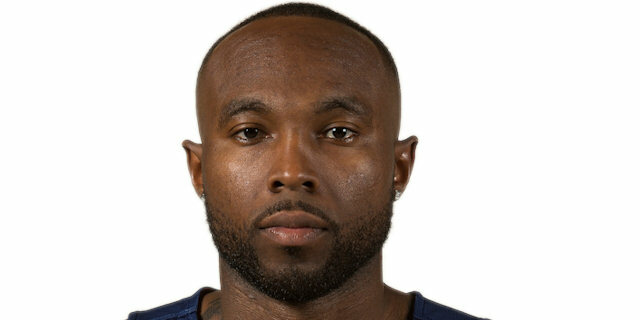 Tyrese Rice and Sasha Vezenkov each added 13 while Justin Doellman had 11 for Barcelona. 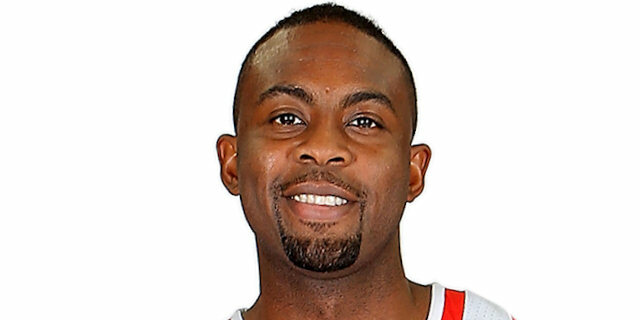 James Anderson led Darussafaka with 21 points. Scottie Wilbekin added 19 while Adrien Moerman had 11 for the guests. Darussafaka controlled the boards in the first half. 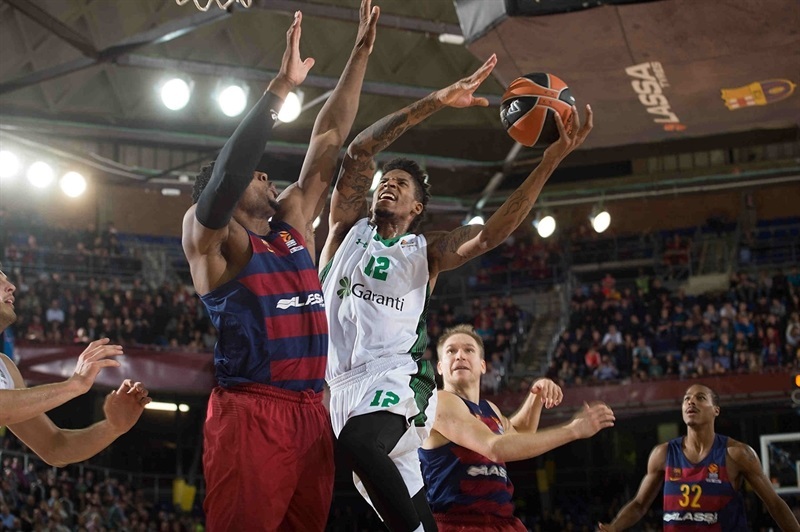 All 10 of the visiting players had at least one rebound before the break, helping Darussafaka lead Barcelona in that category by 13-22. 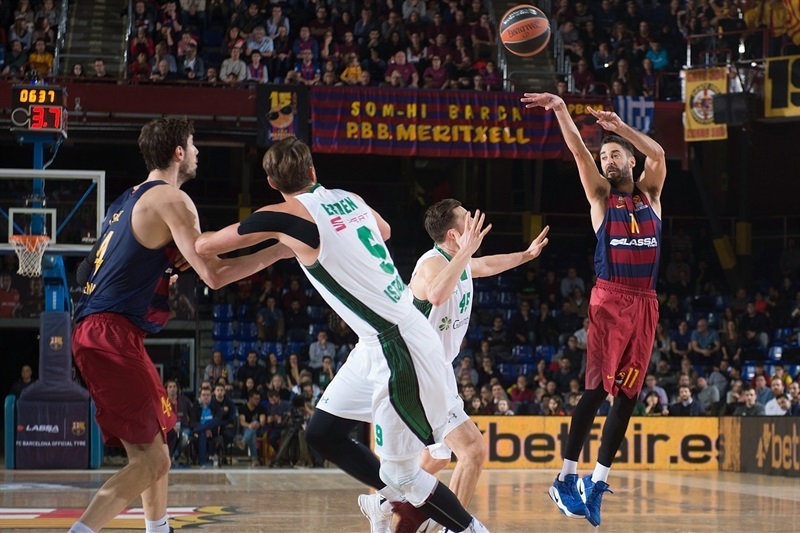 The guests grabbed 10 offensive rebounds to Barcelona's 3, as well, by then. Darussafaka also had just 4 turnovers before back-to-back triples by Wilbekin gave the visitors a 35-40 lead at the break. Things changed after halftime, when Barcelona blasted off with a 14-0 run to take over the scoreboard. The hosts rebounded the ball much better, too, 14-13 in the second half. Barcelona had 22 assists and just 13 turnovers, which also made the difference in a close, exciting game. 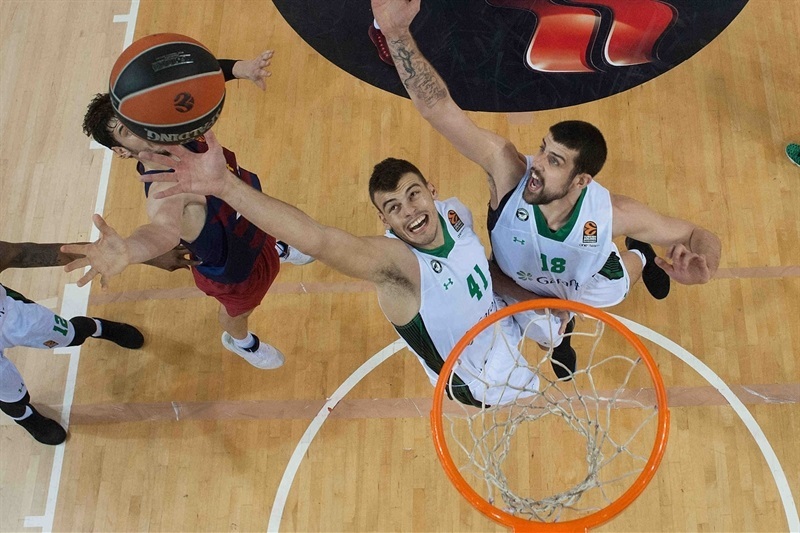 A dunk by Semih Erden and a three-pointer by Anderson gave Darussafaka an early 0-5 lead. 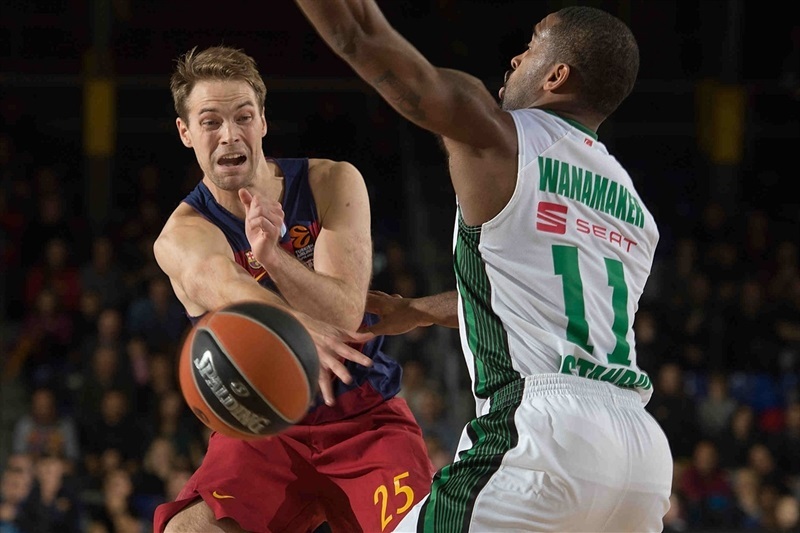 Tomic and Victor Claver stepped up for Barcelona but Anderson and Dairis Bertans struck from downtown for a 6-13 Darussafaka margin. 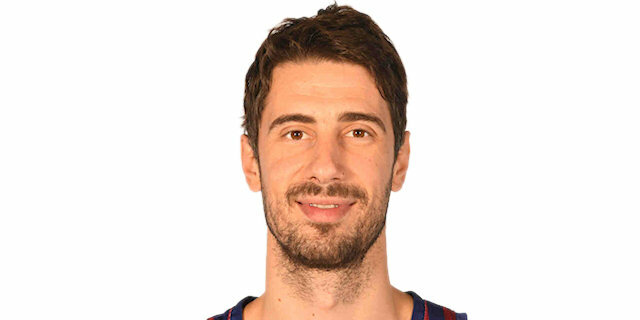 Juan Carlos Navarro joined the three-point shootout, Tomic scored twice in the paint and a driving layup by Vezenkov soon tied it at 19-19. A corner triple by Moerman put the guests back in charge, 19-22, after 10 minutes. A tip-in by Ante Zizic and a big driving basket by Anderson boosted Darussafaka's lead to 19-26 early in the second quarter. 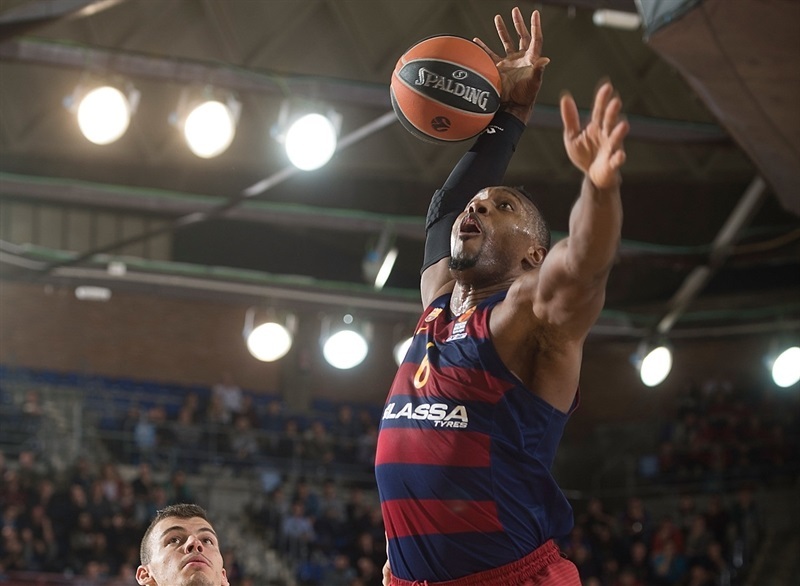 Joey Dorsey dunked before three-pointers by Rice, Alex Renfroe and Vezenkov brought Barcelona closer, 30-32. 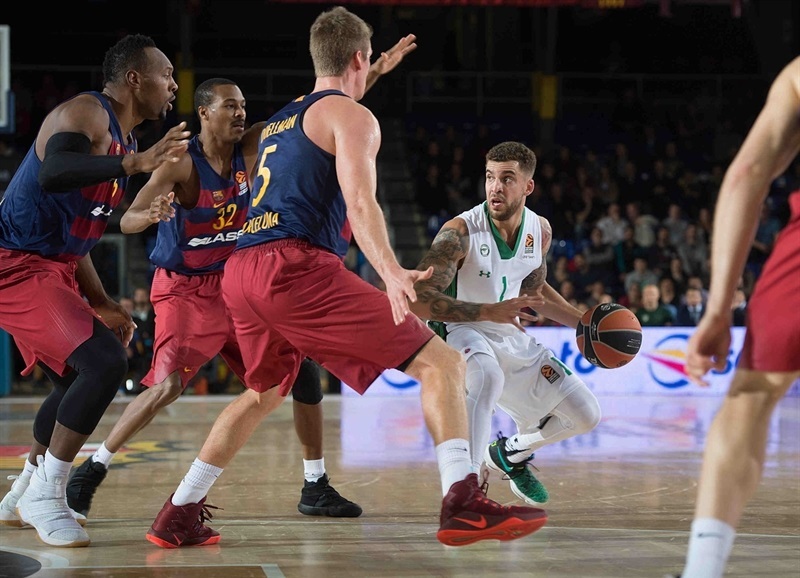 Another triple by Renfroe and an off-balance basket by Vezenkov put Barcelona ahead, 35-34, but Wilbekin struck twice from beyond the arc, beating the halftime buzzer with the second of those for a 35-40 Darussafaka. After the break, Doellman and Navarro each buried a three-pointer in a 14-0 run which Rice capped with an outstanding triple-and-foul, good for a 49-40 Barcelona margin. Wanamaker and Moerman tried to change things for Darussafaka and a layup by Anderson kept his team within 51-47. Anderson stayed hot with a jumper and a triple which Moerman followed with his own shot from beyond the arc for a 53-55 Darussafaka lead. 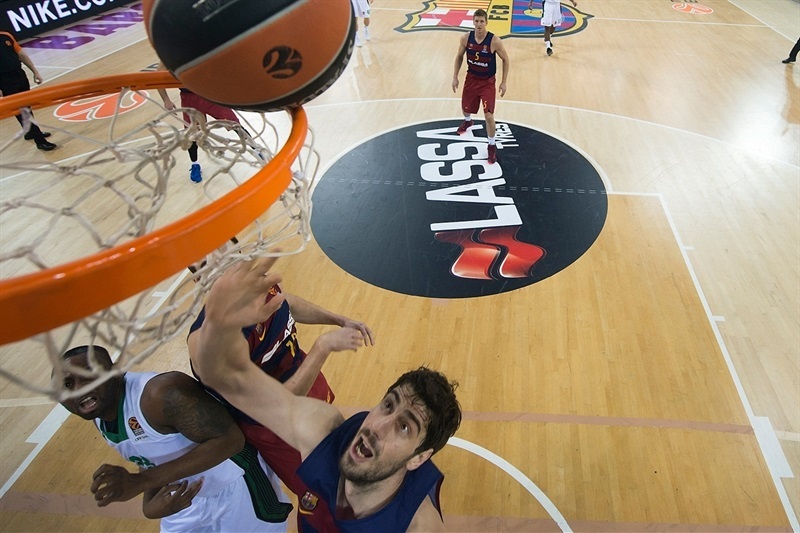 Barcelona looked to Tomic, its go-to guy in the paint, and he helped the hosts get a 59-57 margin after 30 minutes. Consecutive layups by Wanamaker gave Darussafaka a 61-63 lead early in the fourth quarter. 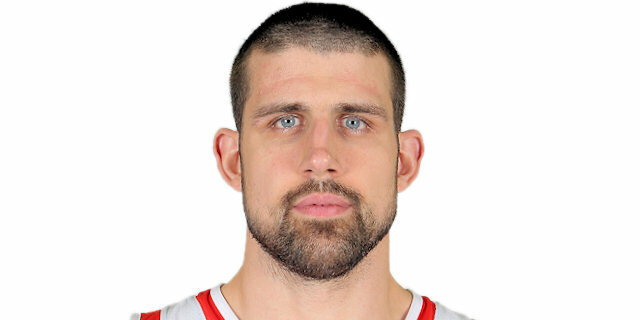 Brad Oleson and Petteri Koponen appeared then with critical baskets and Vezenkov struck from downtown for a 68-65 Barcelona lead with over 4 minutes left. Koponen downed a big three-pointer in the next-to-last minute but Wilbekin singlehandedly kept the guests within 72-71. Rice and Anderson traded layups before free throws by Koponen gave Barcelona a 76-73 lead with 24.7 seconds to go. Koponen hit free throws, Wilbekin, Rice and Wanamaker split attempts and a buzzer-beating triple by Vezenkov rounded out Barcelona's win in style! Both teams play on the road next Thursday: Darussafaka visits Maccabi FOX Tel Aviv while Barcelona faces Brose Bamberg. 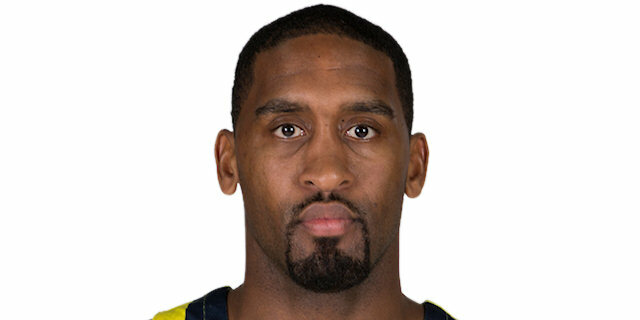 "It was a very important game, like every one in the EuroLeague. You know, we suffered during the game. Darussafaka plays with some un-normal, strange lineups, with four guards in the lineup and one center. They create space and they execute from the outside, excellently. So it was difficult for us to adjust, but the only thing that counts in EuroLeague is to win the game. It's unpredictable, the EuroLeague, with many finals so early in the season, as today was for us like a final. 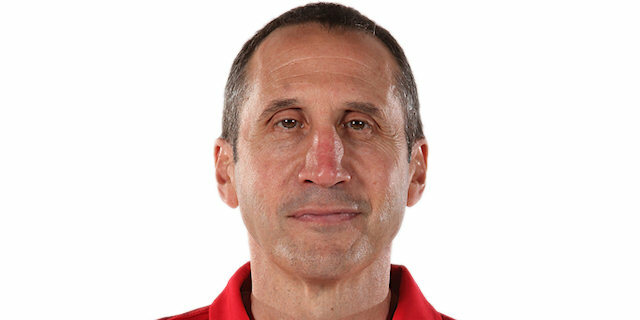 So I have to give credit to my players for this important win." "It was a very difficult game for us, especially mentally. Once again, it was a must-win game for us. 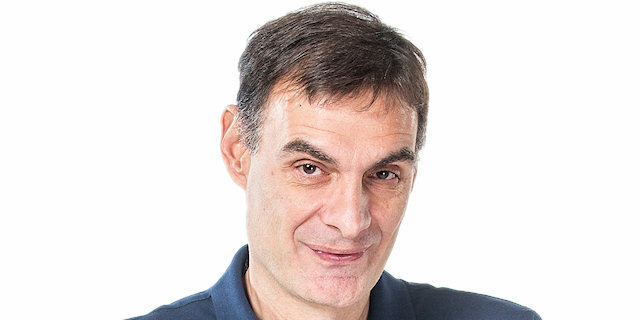 I am happy: no matter how we play, it is important to win every game in the EuroLeague at this moment, and we closed the year with back-to-back EuroLeague wins at Palau. I am gretaful to you guys (the press): you support the team in a fantastic way. The criticism is very positive, and I have to say that. We have great fans who have once again supported us from the first minute until the end, even when we don't play well. This positive atmosphere is very important. I was sick for two days and my coaching team prepared the game, and we finally won it. Every time we have the ability and the desire to pass the ball like we did today, we are very good team. We had 22 assists today, 10 more than Darussafaka, had 30 against Milan. When we don't do this, we struggle. We played good defense on Will Clyburn, which was key for us. I want to wish good health to everyone in 2017, especially to our team. We struggled a lot with injuries in the first part of the season." "First of all, congratulations to Barcelona. I think it was a very well played game by both teams. Sometimes, the game comes down to making a shot or missing a shot. They made a few more than we did, not more than that. Both teams played well. We came back after their 14-0 run and took the lead. When you have a game with two good teams playing well, there are going to be runs. It happens. If both teams play well, momentum shifts in the game. We put ourselves in a position to win the game. We didn't make a few shots and Barcelona did, which is really the story. 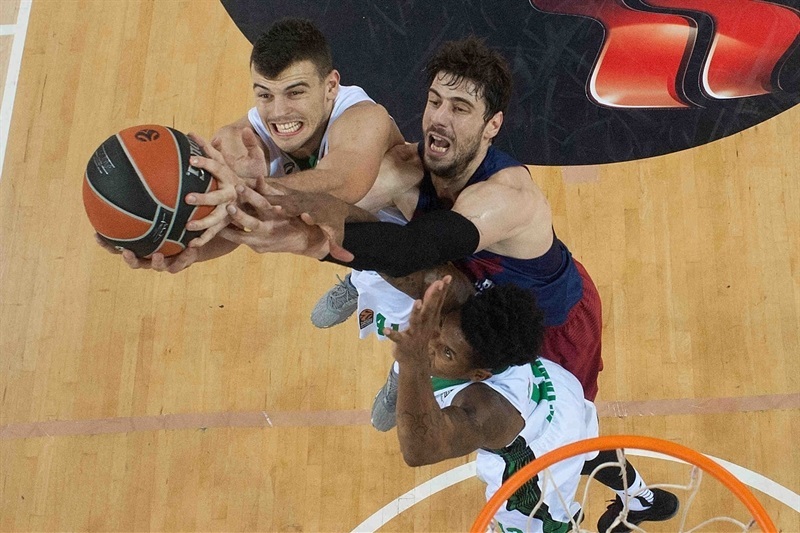 I think Ante Zizic did a terrific job in his first EuroLeague game, after being with the team for two days. It says a lot about the kid, being able to come in and contribute." "It is a big win for us. We just had to do better than we did in the first half on rebounds and finding easy points. I think we did a little bit better and it was enough for us to get a win we needed. We just had to eliminate the things that were allowing them to score easily: offensive rebounds and easy points in transition. We did a better job on that after the break. We have to go game by game, especialy at home; we really need those wins. We did a good job and have to keep that going." "We really picked it up in the third quarter. I think that what helped us was rebounding the basketball. In the first half, we had a big problem with defensive rebounds. I think they had 10 or 11 offensive rebounds in the first half, and that's 10 or 11 possessions that we don't have, transitions that we don't have. We really took care of rebounds after that, were able to run and get some easy buckets. We just have to continue to try to ride this little wave that we are on right now and learn from the things we didn't do well and some of the mistakes that we made. We hve to try to take this same game on the road." "It's a good win to finish the year, winning in front of this crowd. 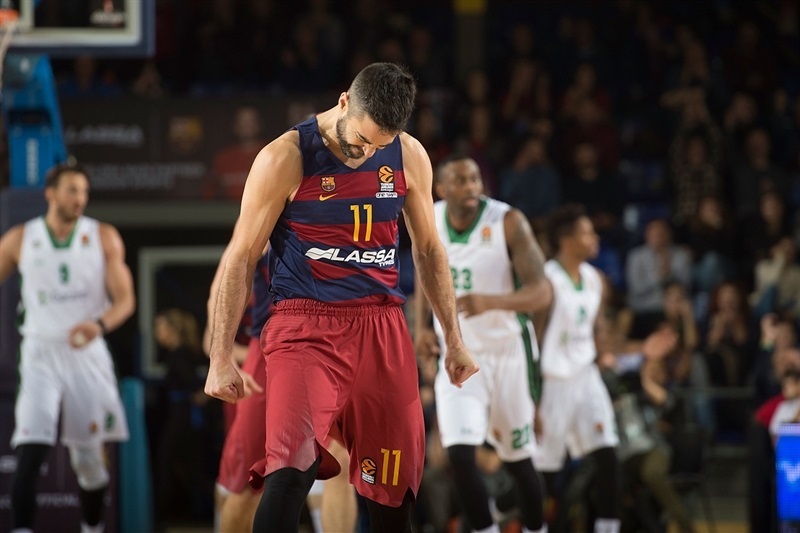 It was also a very important win for us, because of our situation in the EuroLeague this year. So every win is important, and this win we needed to give us the impulse to keep going and to keep winning. Rebounds and controlling the boards: in the first half, we had problems with that. They took 11, 12 or 13. In the second half we did better. Of course, on offense, sharing the ball, scoring important shots and free throws at the end, and that's how we won the game." "It is a tough loss: they made more plays than we did. We fought hard but missed a lot of open shots. They got a little momentum after the break but we kept our composure and went on a run of our own. We stayed in the game, gave ourselves a chance down the end but missed a few plays. Then they made theirs, and that was the game. It was a pretty good first half of the regular season. We could have done a little better and have to do better in the second half to make it to the playoffs." 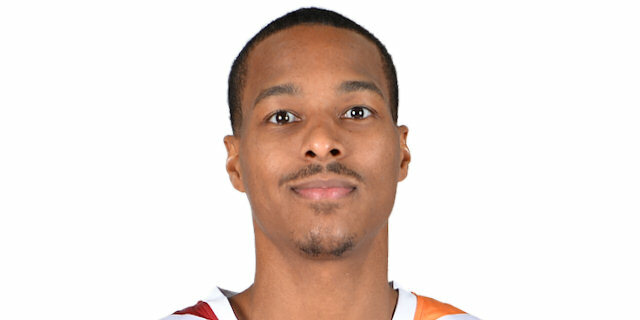 "We played a good game but missed a couple of offensive rebounds in the second half. We need to be positive and get ready for the next game. We have a good record so far but have to keep playing hard and keep going. We have to be ready to win the next one."